UC Davis College Republicans’ event featuring Milo Yiannopoulos, a conservative speaker and Breitbart editor who spoke at UCSD last June, was cancelled by organizers 30 minutes prior to the scheduled time on Friday evening due to student protesters who blocked access points to the venue, according to a press release by UC Davis. The political director of Davis College Republicans, Deborah Porter, stated in an email to the the Aggie that while the organization does not necessarily endorse Yiannopoulos, they believe his presence on campus is valuable. “We do believe that college is a period in life where students must be aware of others’ beliefs and able to support their own values,” said Porter. Yiannopoulos has gained a considerable fanbase for his support of Donald Trump and is a fixture of the alt-right movement, comparing Black Lives Matter to the KKK while criticizing feminism and Islam, among other movements and religions. Earlier last year, he was banned from Twitter after encouraging and contributing to a slew of racist tweets targeting Leslie Jones, comedian and star of the recent “Ghostbusters” revival. “Any public university must do everything it can to make sure that all members of its community are free to express their views — both because free expression is a right guaranteed by the First Amendment of the Constitution and enshrined in University of California policy and because it is an essential ingredient in higher-education teaching and research,” said Hexter. The event is part of a larger tour by Yiannopoulos, who has upcoming shows scheduled for California Polytechnic State University, UC Berkeley and UCLA, among several other campuses across the country. Last June, as an earlier installment of his current tour across American college campuses, Yiannopoulos was sponsored and hosted at UCSD by the Koala and College Republicans at a sold-out event held at Price Center Theater. As noted by the Union Tribune, his stop at UCSD in June was less protested than appearances at other schools like Rutgers University, where students smeared fake blood on their faces. 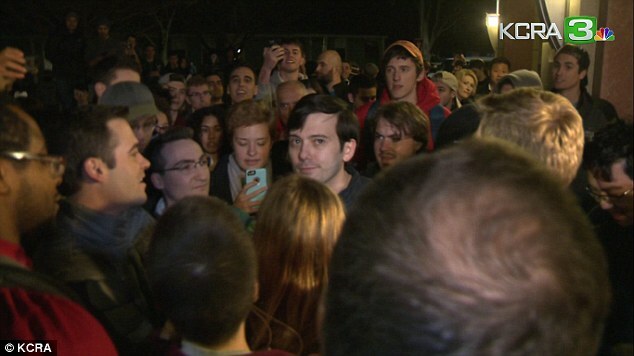 Martin Shkreli, a pharmaceutical executive who gained recognition after raising the price of Daraprim, an HIV medication, from $13.50 to $750 per unit, was set to speak at the event with Yiannopoulos, but only briefly took photos with fans before being pelted with dog feces and escorted away. At 9 p.m., Hexter expressed his disappointment in the events leading up to the cancellation on Twitter. “Deeply disappointed in events tonight. A U is at its best when it listens to & critically engages opposing views,” Hexter tweeted. Maybe he doesn’t call himself an alt-right leader, but he certainly has his sympathies and a massive following. Why don’t YOU do some research? Sick biased article. Quinn you should be ashamed of yourself for failure to fact check and writing something completely one sided. Milo has never, ever, associated himself to the alt-right. In fact he continuously remarks at nearly every event that he doesn’t identify with the alt-right. Shame on you. You have no future in journalism. There was violence. Innocent people were attacked. A news camera operator had coffee thrown in his face. You are omitting this, leaving only Milo’s Tweet then refuting it to make it seem like it was a peaceful protest. You are a disgrace Davis. An absolute disgrace.